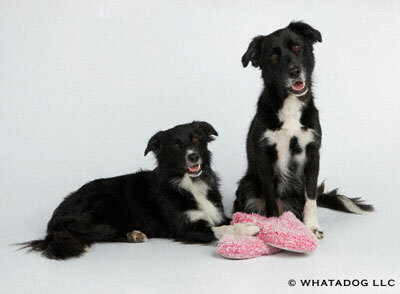 Both Cole and Toula are rescued border collies. Though they share rescue-hood, their rescue stories are very different. Cole was relinquished by his owners at the age of one year and six months old at which time he was taken in by a rescue group. Toula was born at an animal shelter and at three days old taken under the wing of a rescue group. Cole was said to lack intelligence, not trainable and should be put to sleep prior to coming into rescue. Toula came into my life at the young age of 6 weeks old. Both Cole and Toula have proved to be extremely intelligent, loving and loyal dogs. When not working with Team WHATADOG, Cole and Toula enjoy numerous activities. Both are dog actors, compete in Agility, Dock Dog Diving, Classic K9 NASCAR Agility, and take part in endless hours of “chuck-it”, swimming and relaxing with their family. As members of Team WHATADOG, one of the most important roles Cole and Toula play is that of the spokes dog for all rescue dogs. If you are considering opening your home to a new dog, please consider a rescue dog. Team WHATADOG: Behind every successful business is a dog, or two. Team WHATDOG is proud to have two very special K9 assistances, Cole and Toula. Both Cole and Toula are key components in our training program. They have each logged hundreds of hours assisting in training and working side-by-side with WHATADOG clients. Cole and Toula have had a profound effect on many WHATADOG clients, both human and K9 alike. Because of Cole and Toula, many K9 WHATADOG clients have been able overcome socialization issues, behavioral issues and excelled in overall obedience training. Cole and Toula have educated many human WHATADOG clients as to what a dog is capable of, regardless of age and background. Posted in WHATADOG | Comments Off on Team WHATADOG: Behind every successful business is a dog, or two.